There’s been a lot in the news lately about chefs and consumers getting involved in processing their own meat. While there are lots of chefs hosting nose-to-tail fabrication demonstrations in their restaurants, there are still few opportunities for chefs and consumers to get hands-on experience in the slaughtering process. I’m fortunate enough to live 30 minutes away from a farm that does just that. This past Saturday morning (Halloween day oddly enough), I woke up at 6 AM to join farmers Pete Lowy and Jen Hashley of Pete & Jen’s Backyard Birds in Concord, Mass., for the last “Processing Day” of the season. Pete & Jen’s birds are famous in and around Boston and there is a long waiting list of customers (including chefs) hoping to get one of their pasture-raised birds. You’d be surprised how many people are willing to wake up early on a Saturday morning to help slaughter and eviscerate chickens. I was joined by 15 other volunteers, some who purchase birds from Pete & Jen on a regular basis, others who have a general interest in animal husbandry, and people like myself who are curious to learn more about the whole process. It was great to see a few familiar faces like member chef Jason Bond, who regularly volunteers his time and butchering expertise on processing day. Pete and Jen process few enough birds a year that they’re able to do so on their farm using a rented Mobile Poultry Processing Unit (MPPU) which is fully equipped with killing cones, scalder, plucker, sink, and evisceration area. Pete and Jen would like to see more MPPU’s available to small farmers in Massachusetts in the hopes that it will strengthen the regions’ local food system and are working to raise $35,000 to build a second unit in Eastern Massachusetts. I spent most of the morning eviscerating Capons and retired egg-layers with the other rookie processors. After the intial “eww” factor, I began to find the process really interesting and well… kind of fun. Later in the morning Pete came over and asked if anyone was interested in killing a chicken. I was second in line and was, to my surprise, not that nervous cutting the throat of the 2 lb layer chicken. The birds were remarkably calm and I could tell they’d had quite the life on this beautiful farm. We spent the next hour or so packing and labeling the chickens. Nothing is wasted. Heads, necks, gizzards, livers, hearts, and feet are packed, labeled, and sold. Even the fat is saved and sold to a local artisan who makes soap. Blood, feathers, and inedible organs are added to the compost pile. There were a lot of things that struck me about this experience, but most of all I was impressed by the strong community Pete and Jen have built around their farm. After we finished packing all the chickens, we changed out of our work clothes, and Pete and Jen served us a delicious lunch of sandwiches, pickles and cookies from the Verrill Farm farmstand to thank us for a hard day’s work. They really couldn’t do it without us, and I think we all felt good about being a small part of their success. Wow, I’m very impressed you got over the “eww” factor. Sounds like it was a worthwhile and memorable experience! Thanks for reading! Pete and Jen’s Backyard Birds are great friends doing great work! I love it..finally what a wonderful project I would love to spend the day being a part of that. We all need to know and understand our food system better so important! So I actually got assigned to do a bit of research about this website when I stumbled upon this. I am a culinary student at Grand Rapids Community College in Grand Rapids, Michigan. Our chef is very passionate about educating his students about sustainability, factory farming, etc. After learning about factory farming I became very interested in animal husbandry and taking part in the food I eat and prepare. This concept is such a great idea and I’m so glad that there are other out there who want to take part in preparing their food. Glad to hear you’re learning about sustainability in culinary school! I’ll bet if you looked around you could find community farms in your area where volunteers can do work like we talked about above. Definitely. If you ever find a similar project up your way let us know! My wife (Barb) and I have a similar operation. 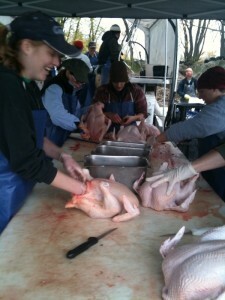 We process birds on Saturdays during the season, with the help of several volunteers. It is a wonderful thing to be a part of. We are so thankful for thier support as well as the support from the rest of our community. How big is your operation? Do any local chefs ever volunteer? At Pete & Jen’s there is at least one chef who is a regular. He even contracted with them to raise a couple of pigs for the restaurant. Great Job Mate! I agree with your Blog and I will be back to check it more in the future so please keep up your work. I love your content & the way that you write.